Peony plants are found growing naturally in the gardens of Europe, China, and the Western U.S.
From one corner of the globe to another, peony plants long have been transplanted and admired. In China, they are prized for medicinal uses, with the root of white peony root used to treat liver problems. The Greeks and Romans also found medicinal uses for peonies. Peony derives its name from a Greek myth. Paeon, a student under Aesculapius, god of medicine, was well aware of the medicinal qualities of peony plants. He used them to heal a wound suffered by the god, Pluto. The upstaged Aesculapius wasn’t pleased and threatened retribution, but, in one of those charming metamorphoses sprinkled liberally throughout the pages of Greek mythology, Pluto saved Paeon’s life by turning him into a peony plant. with the standard pronunciation: pee’-uh-nee. These fragrant flowers prefer full sun. 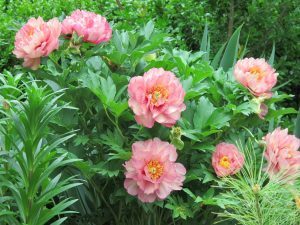 An exception to this rule applies to gardens below the 4500-foot elevation where, due to the summer’s intense heat, peonies benefit from shade through mid-day. Grow peony plants in a soil that is fertile and well-drained, with a pH of 6.0 – 7.0, or as acidic a possible in the Arizona mountains. Through March, all you’ll see is the rebirth of the crown popping through the soil. Each plant is actively growing in April with flower buds soon to follow. Dig a shallow, yet wide hole and set the peony plant in the hole. I cannot stress enough the importance of drainage for peonies. Amend the soil heavily with Premium Mulch and water well with Root & Grow that stimulates new root growth, best for transplanting flowers. Peonies often are planted individually. When sharing perennial beds with other flowers, due to their sizable maturity, they should be planted towards the back row. More often, peonies are planted in groups, side by side, to form a row. They make a bold statement in the garden when planted in this traditional style of English formal gardens. Support peony plants with stakes or hoops, just as you would tomatoes. The large blooms get heavy, especially after rain. Trimming back and disposing of the foliage in autumn helps prevent disease. Other conditions may cause a gradual decline in your peony plants. If you see one specimen is stunted while the peony plants around it are doing fine, remove and destroy that plant before it infects the others around it. Peonies like to be mulched heavily through winter. Apply a 2-3″ layer of shredded cedar bark over your plants after the foliage has died back in fall. Often, when we see pictures of huge, beautiful flowers in books, we assume they come from the tropics. Mother Nature made an exception with mountain peony plants. Cold hardy to below -20 degrees, they grow even in the most frigid north-facing gardens in Arizona. Peonies can hold their own with even the most beautiful tropical flowers, but with far better fragrance. Plant peonies in gardens near entrances and patios where their fragrance can be enjoyed readily. Lisa and I grow a stunning Itoh peony, the most fragrant of all perennials, in a large container. Placed by the entrance to our house, it’s unavoidably enjoyed by all approaching the front door. While their blooming period is short, even the foliage of peonies is sufficiently attractive to warrant planting in a cozy corner near the doorstep. 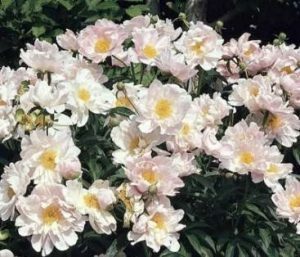 The peony plants with double flowers tend to be the most fragrant. To extend the blooming season, “stagger” your selection of varieties. That is, select some that bloom early, others late, and still others that bloom sometime in between. As if stunning beauty and heady fragrance weren’t enough, peony plants are also exceedingly long-lived. Peonies are unlike many other perennials, in that they do not need to be divided regularly. In fact, they dislike being disturbed. If you do divide them to increase your stock, autumn is the best season to do it. Watters Garden Center has the best selection of peony plants just before their spring bloom. 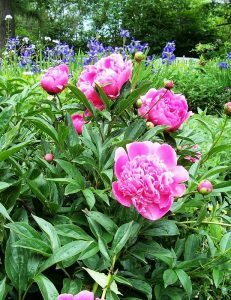 Now is the ideal time to add some new peonies for perennial colors in your gardens. April 7 @ 9:30 am Drip Irrigation Design & Installs – April is time to get that irrigation system up and running. Learn the benefits of drip irrigation, new technologies, and how to set up a system or add a plant to it. With the right irrigation, you can save water and have healthier plants all at the same time. Don’t know how to install and run an irrigation clock? We’ll teach you! Watters’ bins of irrigation parts will be fully stocked in preparation for this class. Come early and bring a lawn chair; over 100 students attended this class the last time it was offered! Until next issue, I’ll be here at the garden center helping gardeners grow better flowers.